A deliciously lemony lemon cake. Gooey, crunchy, indulgent, perfect for an afternoon snack, sitting in the late summer sunshine with a cup of tea and a couple of minutes of ‘me’ time. The hectic world that we live in – juggling work, babies, London life, computer screens, it is so important to switch off for a moment, to let your mind wander to a happy place. We have started imposing a ban every now and then on the phone and social media, if away with the family at the weekend or on a romantic get away, or simply at home on a rainy Sunday and it feels so good. Having that moment with a slice of cake, couldn’t really get any better. You could also serve this cake as a desert, bake it in a round tin instead so it doesn’t feel so ‘afternoony’ and serve with either a dollop of crème fraiche, or whip up some double cream with a little maple syrup and vanilla. And serve with some fresh berries. The day that we were recipe testing this cake we had come back from a walk – getting out the kitchen and stretching the legs on a Saturday afternoon, on the way back we walked past the vegetable and fruit garden where we found an abundance of plump blackcurrants and bushes laden with gooseberries, what happiness this brings. 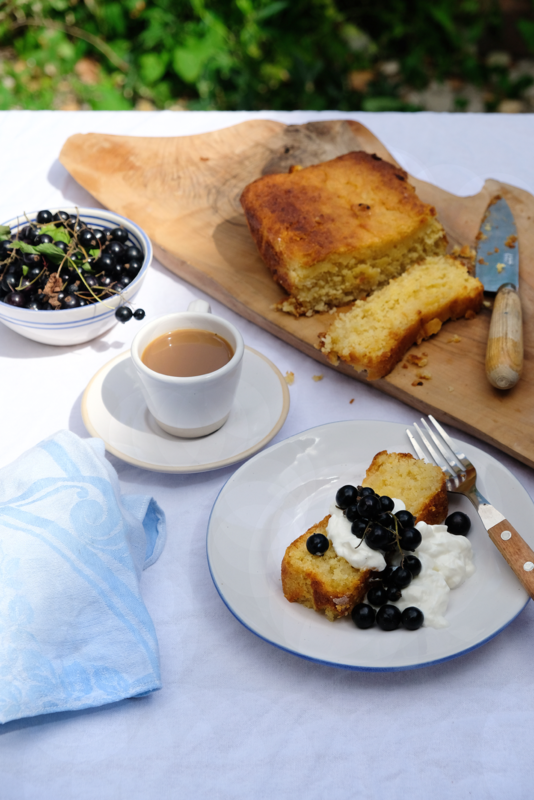 The blackcurrants were perfect with the cake, if you can’t get your hands on any then serve with blackberries. The gooseberries we made into a crumble with a very nutty top and served with vanilla ice cream – sometimes nothing beats a good British desert. There is always that slight excitement at the turn of a season, for us now moving into late summer, although sad to say goodbye to apricots, peaches and strawberries we are about to welcome once again apples, plums, blackberries and damsons, nice to pair with spices like cinnamon, cloves and star anise. We love poaching plums for breakfast with those spices, as well as a little vanilla and bay. A spoon of poached plums on top of coconut porridge, what a heavenly way to start the day. 1. Pre heat oven to 180c. and line a loaf tin (also works nicely in a round cake tin). 2. Place the shredded coconut in a small bowl and add the lemon juice and rind, leave to soak. 3. Place the butter and the sugar in a bowl and beat with a whisk, add the flour, eggs, coconut milk, vanilla and baking, beat till smooth and add in the shredded coconut and lemon mixture, combine. 4. Pour into the tin and bake for about 30 mins, till just golden on the top and with a slight bounce to the touch. Turn out onto a cooling rack. 5. Mix together the caster sugar and lemon juice and pour over the warm cake and leave to soak in.